January 12, 2016 - Back in 2010, the Federal Aviation Administration (FAA) posted a Notice of proposed rulemaking (NPRM) that would require student pilots and licensed pilots to have a FAA photo ID which was referenced Notice of proposed rulemaking (NPRM) Docket No. FAA-2010-1127; Notice No. 2010-16 RIN 2120-AJ42 - Photo Requirements for Pilot Certificates. Today, the FAA released its Final Rule as it relates to student pilots with an effective date of April 1, 2016, which will require student pilots to have an FAA photo ID. Student pilots will no longer use their medical as their student pilot ID. Instead, the student pilot will obtain his or her student pilot certificate through their closes Flight Standards District Office (FSDO), designated pilot examiner, airman certification representative associated with a pilot school, or certified flight instructor. Aviation Medical Examiners will no longer issue a combination medical certificate and student pilot certificate. Upon the effective date, student pilots will not be able to exercise the privileges of a student pilot unless he or she has on their possession a plastic pilot certificate with photo that is issued by the FAA. Back in 2004, President George W. Bush signed the Intelligence Reform and Terrorism Prevention Act of 2004 (IRTPA). This act was to address the United States federal terrorism laws, it included several separate titles with varying subject issues. One of the issued addressed was the need to have all pilots, including student pilots be issued a pilots license that was resistant to tampering, altering, or counterfeiting. Include a photograph of the individual to whom the certificate was issued to and capable of accommodating a digital photograph, a biometric identifier, or any other unique identifier the FAA Administrator considers necessary. In addition there would be a fee the pilot would have to pay for every ID issued to the pilot. The FAA posted this new rule NPRM online (Notice No. 2010-16 RIN 2120-AJ42). At which time the FAA received a number of complaints from the aviation community. 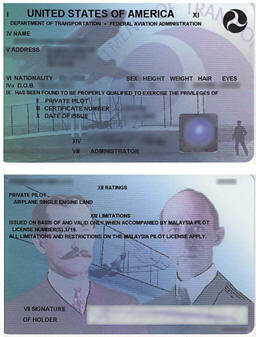 Most pilots were in favor of a photo ID but not the fee structure. As a result the FAA has reduced the fee from $22 to $2.00 for student pilots and forgo the photo requirements for pilots under this NPRM. However, the FAA is in the processes of developing a new NPRM that will address photo requirements for all pilots but will eliminate many of those concerns that pilots had raised.